Solid-core photonic crystal fibers with the core derived from non-doped or Erbium-doped sol-gel silica rods are fabricated. The results demonstrate that the direct polymeric sol-gel route constitutes a promising method to prepare large high quality glass pieces that can be integrated into microstructured optical fibers suitable for passive and active optical fiber applications. P. Kaiser and H. W. Astle, “Low-loss single-material fibres made from pure fused silica,” Bell Syst. Tech. J. 53(6), 1021–1039 (1974). J. C. Knight, J. Broeng, T. A. Birks, and P. S. J. Russell, “Photonic band gap guidance in optical fibers,” Science 282(5393), 1476–1478 (1998). D. J. DiGiovanni and R. S. Windeler, U.S. patent 5,907,652 (13 March 1998). J. C. Knight, “Photonic crystal fibres,” Nature 424(6950), 847–851 (2003). A. Bjarklev, J. Broeng, and A. S. Bjarklev, Photonic Crystal Fibres, Kluwer Academic Publishers (2003), The Netherlands. 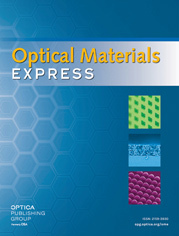 O. Frazão, J. L. Santos, F. M. Araújo, and L. A. Ferreira, “Optical sensing with photonic crystal fibers,” Laser & Photon. Rev. 2(6), 449–459 (2008). J. Lægsgaard and A. Bjarklev, “Microstructured optical fibers-fundamentals and applications,” J. Am. Ceram. Soc. 89(1), 2–12 (2006). C. J. Brinker and G. W. Scherer, Sol-Gel Science, Academic Press: New York (1990). L. L. Hench and J. K. West, “The sol-gel process,” Chem. Rev. 90(1), 33–72 (1990). J. H. Oh, United States Patent 6,519,976 (2003). L. Costa and D. Kerner, “High purity glass forms by a colloidal sol-gel process,” J. Sol-Gel Sci. Technol. 26(1–3), 63–66 (2003). S. Bhandarkar, “Sol-gel processing for optical communication technology,” J. Am. Ceram. Soc. 87(7), 1180–1199 (2004). R. T. Bise and D. J. Trevor, Proc. Optical Fiber Commun. Conf (OFC), Washington, DC, Mar. 2005, vol. 3, invited paper OWL6, Optical Society of America. W. Stręk, P. J. Dereń, K. Maruszewski, E. Pawlik, W. Wojcik, G. E. Malashkevich, and V. I. Gaishun, “Spectroscopic properties of erbium doped silica glasses obtained by sol-gel method,” J. Alloy. Comp. 275–277, 420–423 (1998). C. G. Guizard, A. C. Julbe, and A. Ayral, “Design of nanosized structures in sol-gel derived porous solids. Applications in catalyst and inorganic membrane preparation,” J. Mater. Chem. 9(1), 55–65 (1999). N. N. Khimich, G. M. Berdichevskii, E. N. Poddenezhnyi, V. V. Golubkov, A. A. Boiko, V. M. Ken’ko, O. B. Evreinov, and L. A. Koptelova, “Sol-gel synthesis of an optical silica glass doped with rare-earth elements,” Glass Phys. Chem. 33(2), 152–155 (2007). H. El Hamzaoui, L. Courtheoux, V. Nguyen, E. Berrier, A. Favre, L. Bigot, M. Bouazaoui, and B. Capoen, “From porous silica xerogels to bulk optical glasses: The control of densification,” Mater. Chem. Phys. 121(1–2), 83–88 (2010). J. Schroeder, in: M. Tomozawa, R. Doremus (Eds), Treatise on Materials Sciences and Technology, Vol. 12, Academic Press, New York (1977), p. 157. P. S. J. Russell, “Photonic-crystal fibers,” J. Lightwave Technol. 24(12), 4729–4749 (2006). K. Tajima, J. Zhou, K. Nakajima, and K. Sato, “Ultralow loss and long length photonic crystal fiber,” J. Lightwave Technol. 22(1), 7–10 (2004). O. Humbach, H. Fabian, U. Grzesik, U. Haken, and W. Heitmann, “Analysis of OH absorption bands in synthetic silica,” J. Non-Cryst. Solids 203, 19–26 (1996). M.-C. Phan-Huy, J.-M. Moison, J. A. Levenson, S. Richard, G. Mélin, M. Douay, and Y. Quiquempois, “Surface roughness and light scattering in a small effective area microstructured fiber,” J. Lightwave Technol. 27(11), 1597–1604 (2009). S. Pal, A. Mandal, G. De, E. Trave, V. Bello, G. Mattei, P. Mazzoldi, and C. Sada, “Improved photoluminescence properties of sol-gel derived Er3+ doped silica films,” J. Appl. Phys. 108(11), 113116 (2010). E. Desurvire, Erbium-Doped Fiber Amplifiers: Principles and Applications, John Wiley and Sons, Inc., New York (1994). W. J. Miniscalco, “Erbium-doped glasses for fiber amplifiers at 1500 nm,” J. Lightwave Technol. 9(2), 234–250 (1991). E. M. Pawlik, W. Stręk, P. J. Dereń, J. Wójcik, G. E. Malaskevich, and V. E. Gaishun, “Optical properties of erbium-doped silica fibers obtained by sol-gel method,” Spectrochim. Acta A Mol. Biomol. Spectrosc. 55(2), 369–373 (1999). B. Tortech, A. Gusarov, M. Van Uffelen, J. Bisutti, S. Girard, Y. Ouerdane, A. Boukenter, J. P. Meunier, F. Berghmans, and H. Thienpont, “Pulsed x-ray and continuous gamma radiation effects on erbium doped optical fibers properties,” IEEE Trans. Nucl. Sci. 54(6), 2598–2603 (2007). S. Girard, Y. Ouerdane, M. Bouazaoui, C. Marcandella, A. Boukenter, L. Bigot, and A. Kudlinski, in Symposium abstracts book: 8th symposium SiO2, Advanced Dielectrics and Related Devices, Varenna: Italy (2010). J. Canning, E. Buckley, and K. Lyytikainen, “Propagation in air by field superposition of scattered light within a Fresnel fiber,” Opt. Lett. 28(4), 230–232 (2003). J. Canning, E. Buckley, and K. Lyytikainen, “Multiple source generation using air-structured optical waveguides for optical field shaping and transformation within and beyond the waveguide,” Opt. Express 11(4), 347–358 (2003). Fig. 1 (a) Photograph of the sol-gel silica xerogel stabilized at 1000 °C (b) silica glass rod prepared from this xerogel after dehydration and densification. Fig. 2 Light scattered intensity of sol-gel and Suprasil glasses as a function of angle. Fig. 3 Attenuation spectrum of undoped pure silica Sol-gel core PCF. In the inset, a Scanning Electron Microscope (SEM) image of the cross-section of pure silica sol-gel core PCF. Fig. 4 Erbium concentration profile of SiO2Er3 preform determined using EPMA analysis. In the inset, a zoom in the rod central zone. Fig. 5 Room temperature PL kinetics of 4I13/2 state of Er3+ ions recorded at 1530 nm under excitation at 980 nm for SiO2Er1, SiO2Er2 and SiO2Er3 preforms. Fig. 6 Scanning Electron Microscope (SEM) image of the cross-section of PCFEr1 fiber (left). Zoom on this image showing the sol-gel Er-doped solid core of this fiber (right). Fig. 7 Room temperature spectra of PCFEr1 and PCFEr3 microstructured fibers in the infrared region: (a) absorption spectra and (b) PL spectra upon excitation at 980 nm. Fig. 8 (a) Gain profile at 122 mW and (b) gain at 1535 nm, as function of pump power for the PCFEr3 fiber (4.9 m length fiber).